Venezuelan foreign minister tells Swiss Confederation that the government country rejects the Swiss economic attacks that violate the UN Charter Agreement. 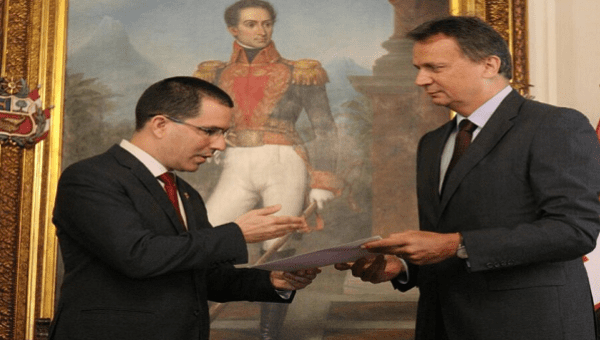 April 2 (teleSUR) Venezuelan Foreign Minister Jorge Arreaza communicated to the head of negotiations of the Swiss Confederation, Didier Chassot, that the South American country rejects the Swiss government’s attacks. In a formal note to Chassot, the Venezuelan chancellor says that the economic sanctions and restrictions that the Swiss government placed on Venezuela last week “demonstrate the (Swiss) subordination to members of the European Union and the U.S. government.” Arreaza’s note reminded Chassot that the Swiss sanctions violate the fundamentals of the United Nations Charter that both countries signed. The communique read that Switzerland’s move does not foment dialogue but solidifies extremist views that are using violence for solutions. “Let’s remember that these measures threaten not only the stability of the Venezuelan people but also create difficulty for Swiss businesses operating in Venezuela,” communicated Arreaza on behalf of his government. The Swiss government ordered asset freezes and travel bans for certain Venezuelan companies, organizations, and functionaries, including seven Venezuelan ministers and high-ranking officials, including former National Assembly President Diosdado Cabello, Interior Minister Nestor Reverol, and Chief Justice Maikel Moreno. The Venezuelan government is demanding sovereignty in its internal affair and that the Swiss government ends its hostile blockade.